I have to confess that I’m a sucker for anything green – either eco-green or just plain green-green. I had a green bass (of the green-green sort) for a while – a 5 string Status Graphite Bass – but have been at the more traditional end of the spectrum for a while, so Musicman’s latest little limited edition bass grabbed my attention. The Dargie Delight Limited Edition package includes a very green (as in green-green) Stingray. I say green, but it is actually a two tone iridescent green finish called “Caramel Apple Delight” – the picture gives a feel, but you’ll have to see it in the flesh to capture the full glory of it! Definitely an eye catching paint job – rare on basses, but I’m sure you can point me to some other examples! The bass also has striking custom inlays on the neck which mark it out. Orders are only open for a few more days – August 13th 2009 – I’ve spotted that The Perfect Bass are shipping them out. The limited edition stretches to most of the other models in the Musicman range, so if you aren’t a Stingray kind of a person, there are other options available, but you’ve got to like it green! That looks a bit like the Nissan(?) cars a while back with some clever paint that changed between green and purple depending on the angle. A neat idea, but can’t they do less vomit-inducing colours? Personally I’m not into fancy finishes on instruments or cars. They only get damaged and then cost a fortune to put right, but I know looks matter for others. Hi Steve, yes it does! I think TVR also used similar paint technology once upon a time. Actually, I think it would look even cooler when vintage/roadworn ;). I want to know where I can find that paint… I want to paint it all green! Seriously if you know where I can find this paint send a comment! I’ve got a Green Yahmmmy 5’er…..
OK. OK, here’s a pic. 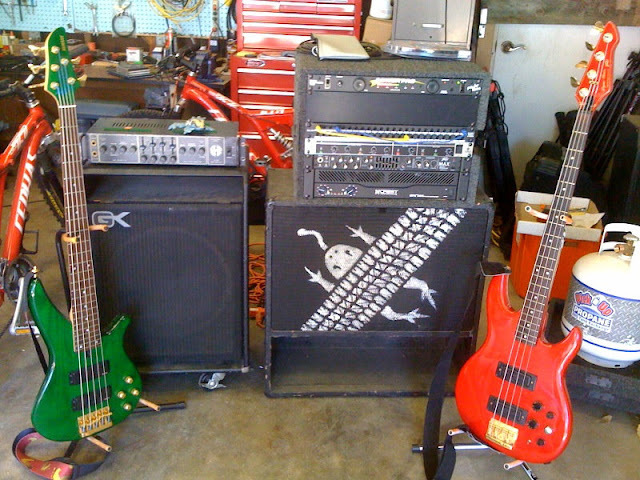 Yes, that’s red Peavey Dyna Bass, my newest acquisition. Actually, it’s been my only acquisition in the last several year. Money’s been tight. But it replaces a black one that was stolen in 2000. Try one if you ever get a chance. They have very fast necks, and the bass absolutely growls. The logo on the 65 VOX cab is my own. Right after graduating from college, I for some unknown reason decided to start a T-Shirt company. It lasted four months – turns out I hated designing shirts. Though I didn’t make much money,I was always fond of the “Frog Crossing” design. After the original VOX material disintegrated, I decided to put that on it. PS. That one was also stolen at the same time the Dyna was swiped (house got burgled), but it eventually recovered and returned three years later. My beloved black Dyna has yet to be found, BUT, I still hold on to a sliver of hope. My San Diego guitarist found his beloved red Charvel online, in New Jersey, fourteen years after it was stolen from his apartment on Coronado Island. Had to pay something like $3500, but he got it back. Hey, just wanted to give you a follow-up. A week after I wrote the last comment. I got a beat on a red DynaBass -$220 including shipping from Fla. I forgot just how fantastic this model is. The neck is incredibly fast, and the sound… it positively growls!!!!! Ha, that is SO true!